UPPER EAST SIDE — When Bob and Susan Eden were newlyweds, the couple stumbled into Gino's Restaurant to find Frank Sinatra waiting for a table at the bar. After a while, a waiter told Sinatra that his table was ready. The legendary singer then looked over to the young couple and said, "Ah, give it to the kids." Bob Eden has since passed away, but Susan Eden came to Gino's, at 780 Lexington Avenue, on Friday to relive her memory one last time. The Italian restaurant was set to close its doors Saturday after 65 years in business. "We couldn't even eat,” she remembered. “We were so awestruck we didn't know what to do. A sinking economy and rising rent-prices have forced owners Michael Miele and Salvatore Doria to close their doors. "It's a piece of New York," Doria said. "We thank all the customers in America and internationally. We thank them for all their wonderful support." Since opening its doors in 1945, Gino's had been a spot for no-fuss Italian meals with old school service. The menus and the waiters have stayed the same for years. Marco Dell'Aguzzo, a waiter for 25 years, wore a Ralph Lauren bow tie on duty Friday, a Christmas gift to staff from the fashion mogul who is a regular customer. 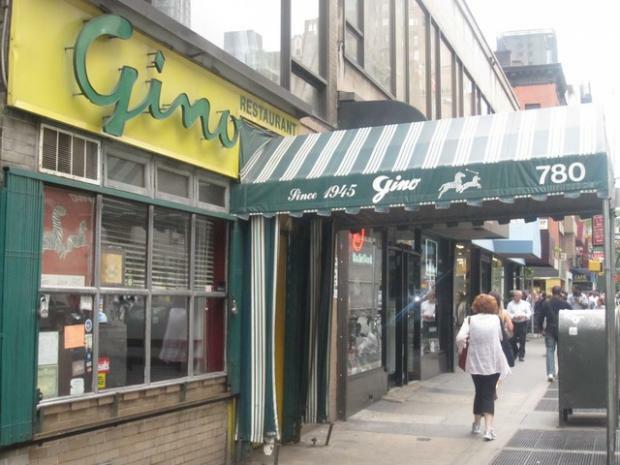 Although the likes of Sinatra, Al Pacino and Francis Ford Coppola all dined at the restaurant, Gino's was also a neighborhood spot frequented by locals. Armyn Green, of Murray Hill, stopped by for her favorite rigatoni with secret sauce during the lunch rush on Friday. But even as the eatery was about to be shuttered, Miele wouldn’t reveal the sauce’s recipe. "He wouldn't tell me because he might open a different restaurant," Green said. Another Italian restaurant, East Harlem’s Rao's, doesn’t seem to be hurting in the down economy. It recently put a table reservation up for auction on Ebay, with bids starting at $5,000.